Can I tell a patient that I cannot treat her because I don’t have accessible medical equipment? Generally no. You cannot deny service to a patient whom you would otherwise serve because she has a disability. You must examine the patient as you would any patient. In order to do so, you may need to provide an accessible exam table, an accessible stretcher or gurney, or a patient lift, or have enough trained staff available who can assist the patient to transfer. Is it OK to tell a patient who has a disability to bring along someone who can help at the exam? No. If a patient chooses to bring along a friend or family member to the appointment, they may. However, a patient with a disability, just like other individuals, may come to an appointment alone, and the provider must provide reasonable assistance to enable the individual to receive the medical care. This assistance may include helping the patient to undress and dress, get on and off the exam table or other equipment, and lie back and be positioned on the examination table or other equipment. Once on the exam table, some patients may need a staff person to stay with them to help maintain balance and positioning. The provider should ask the patient if he or she needs any assistance and, if so, what is the best way to help. If the patient does bring an assistant or a family member, do I talk to the patient or the companion? Should the companion remain in the room while I examine the patient and while discussing the medical problem or results? You should always address the patient directly, not the companion, as you would with any other patient. Just because the patient has a disability does not mean that he or she cannot speak for him or herself or understand the exam results. It is up to the patient to decide whether a companion remains in the room during your exam or discussion with the patient. The patient may have brought a companion to assist in getting to the exam, but would prefer to ask the companion to leave the room before the doctor begins a substantive discussion. Before beginning your examination or discussion, you should ask the patient if he or she wishes the companion to remain in the room. Can I decide not to treat a patient with a disability because it takes me longer to examine them, and insurance won’t reimburse me for the additional time? No, you cannot refuse to treat a patient who has a disability just because the exam might take more of your or your staff’s time. Some examinations take longer than others, for all sorts of reasons, in the normal course of a medical practice. 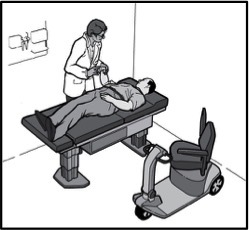 I have an accessible exam table, but if it is in use when a patient with a disability comes in for an appointment, is it OK to make the patient wait for the room to open up, or else use an exam table that is not accessible? Generally, a patient with a disability should not wait longer than other patients because they are waiting for a particular exam table. If the patient with a disability has made an appointment in advance, the staff should reserve the room with the accessible exam table for that patient’s appointment. The receptionist should ask each individual who calls to make an appointment if the individual will need any assistance at the examination because of a disability. This way, the medical provider can be prepared to provide the assistance and staff needed. Accessibility needs should be noted in the patient’s chart so the provider is prepared to accommodate the patient on future visits as well. If the medical provider finds that it cannot successfully reserve the room with the accessible exam table for individuals with disabilities, then the provider should consider acquiring additional accessible exam tables so that more exam rooms are available for individuals with disabilities. In a doctor’s office or clinic with multiple exam rooms, must every examination room have an accessible exam table and sufficient clear floor space next to the exam table? Probably not. The medical care provider must be able to provide its services in an accessible manner to individuals with disabilities. In order to do so, accessible equipment is usually necessary. However, the number of accessible exam tables needed by the medical care provider depends on the size of the practice, the patient population, and other factors. 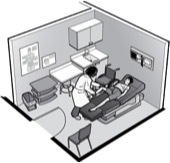 One accessible exam table may be sufficient in a small doctor’s practice, while more will likely be necessary in a large clinic. I don’t want to discriminate against patients with disabilities, but I don’t want my staff to injure their backs by lifting people who use wheelchairs onto exam tables. If my nurse has a bad back, then she doesn’t have to help lift a patient, does she? What should I do if my staff do not know how to help a person with a disability transfer or know what the ADA requires my office to do? Also, I am unsure how to examine someone with spasticity or paralysis. To provide medical services in an accessible manner, the medical provider and staff will likely need to receive training. This training will need to address how to operate the accessible equipment, how to assist with transfers and positioning of individuals with disabilities, and how not to discriminate against individuals with disabilities. Local or national disability organizations may be able to provide training for your staff. This document and other technical assistance materials found on the ADA Website (www.ada.gov) can be used in conjunction with live training to train medical staff. The U.S. Department of Justice ADA Information Line is another resource. Anyone can call the Information Line at 800-514-0301 (voice) or 800-514-0383 (TTY) to speak with an ADA Specialist to get answers to questions about the ADA. Additionally, when preparing to assist a patient with a disability, it is always best to ask the patient if assistance is needed and if so, what is the best way to help. If the provider is unsure of how to handle something, it is absolutely OK to ask the patient what works best. If I lease my medical office space, am I responsible for making sure the examination room, waiting room, and toilet rooms are accessible? Yes. Any private entity that owns, leases or leases to, or operates a place of public accommodation is responsible for complying with Title III of the ADA. Both tenants and landlords are equally responsible for complying with the ADA. However, your lease with the landlord may specify that, as between the parties, the landlord is responsible for some or all of the accessibility requirements of the space. Frequently, the tenant is made responsible for the space it uses and controls (e.g., the examination rooms and reception area), while the landlord is responsible for common space, such as toilet rooms used by more than one tenant. Are there any tax breaks for making accessibility changes to my medical office? Yes. Subject to IRS rules, federal tax credits and deductions are available to private businesses to offset expenses incurred to comply with the ADA. See Form 8836 at www.irs.gov/pub/irs-pdf/f8826.pdf for additional information about the Disabled Access Credit established under Section 44 of the Internal Revenue Code. See Publication 535 (Number 7: Barrier Removal) at www.irs.gov/publications/p535/index.html for more information about the tax deduction, established under Section 190 of the Internal Revenue Code. Both the tax credit and deduction may be taken annually.